Fort Lemhi (1855-1858) - Established 18 Jun 1855 in Lemhi County, Idaho, by a company of Mormons sent by Brigham Young. Abandoned in 1858. Fort Lemhi Lower Marker and Adobe Wall under a Protective Shed. Fort Lemhi Lower Mission Maker. Fort Lemhi Irrigation Project Maker. Established 18 Jun 1855 by a company of Mormons sent by Brigham Young to teach the local Indians how to farm. The Fort was a 16 rod square log stockade enclosing some 25 cabins and an attached 16 rod square adobe corral. This was the first attempt to establish a permanent settlement in Idaho but frequent conflicts with the Nez Perces Indians forced its abandonment in April 1858. Fort Lemhi Access point at Hwy 28 and Tendoy Lane. The roadside marker for this site is located along Hwy 28 at the Muleshoe Ranch entrance. This ranch entrance is marked as private property and you cannot get to the fort site through this entrance. Access to the site is from further south on Hwy 28 at Tendroy Lane (the road to Lemhi Pass) this road intersects Lemhi Road after a short distance and you turn left on Lemhi Road and continue on to the fort site. The site is not marked and you will have to recognize it from the monument on the hill and the lower shed covering the adobe wall. The monument sits on a hilltop that can be reached by a path only and that path is heavily overgrown and not obvious (we did not attempt it). The lower markers and the adobe wall remains can be easily accessed by a small gate alongside the road. 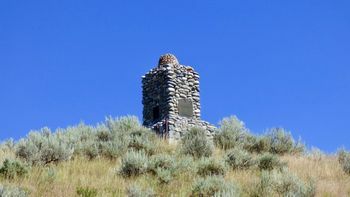 Location: Fort Lemhi Monument located on Lemhi Road near the Muleshoe Ranch, Lemhi County, Idaho. Roberts, Robert B., Encyclopedia of Historic Forts: The Military, Pioneer, and Trading Posts of the United States, Macmillan, New York, 1988, 10th printing, ISBN 0-02-926880-X, page 253.